Romantic second floor apartment near Fresh Pond on Block Island. A Romantic Bungalow styled Loft Apartment on Block island.Open concept, with, stainless steel counters, large full bath and separate large closet with washer and dryer. Tongue and groove walls and ceiling, with vintage styled lighting evoke the feeling of "The Summer of 42" in this unique 1,000 square foot retreat. The secluded Loft apartment has a private deck and yard as well as a large outside shower. Two beach chairs, beach towels, gas grill , two ceiling fans and table fan as well as internet access are provided to enhance your stay. The main house was purchased in 1997. We built the garage in 1999 and my husband built the Loft apartment at the same time. Our daughter stayed in the Loft in the summers during college as she worked on the island. The Loft is over a detached garage that is set back from the house. Neither building is visible by the other allowing privacy for both occupants. The Loft was most recently used as a guest house and was rented for the first time three seasons ago. The property is directly across the street from Fresh Pond. This is our home away from home and the property is meticulously maintained. I am a retired Registered Nurse and my husband is an Oral Surgeon who is retired from private practice. He is on staff at Yale part time, as a Clinical Instructor in the Oral Surgery program. Growing up in CT I visited Block Island frequently as a teenager and young adult. Our family began going to the island in our boat in the early 90's. Since the purchase of of our Block Island home it has been our summer destination. We have three adult children and a granddaughter who still enjoy visiting the island. Block Island is a unique setting providing privacy and more than comfortable accommodations. The property is centrally located on Fresh Pond in the center of the island allowing easy access to beaches and downtown area. After years of visiting Block Island via our boat, we decided this was the place we wanted a summer home. Of all the islands and Coastline areas we visited Block Island was the place for us. Quaint Victorian town, beautiful beaches, beautiful trails and open space. For those that have been to Block Island before you know what I am saying, if you have not visited yet make this your year, and we hope you consider staying in our Loft Apartment. Wherever you land, enjoy all that Block Island has to offer. The property is across from Fresh Pond and abuts one of the many Greenway Trails allowing for easy hiking access and a quite neighbor. There is another Greenway trail across the street that surrounds Fresh Pond as well. Very large full bathroom with shower. There is also a large outside shower. Block Island is surrounded by natural beaches, all are approximately 1.5 miles from the apartment by car all are open to the public there are no charges to park or enter beach areas. Towels, wash cloths and Beach towels. Two Coffee makers: One cup Kurig and 8 cup Drip maker. Basic spices, olive oil, Pam, plastic and foil wrap. Non dairy creamer, sweetners, and six Kurig pods. Bar area with stools. Table and chairs on deck. Two beach chairs and small cooler will also be provided. Great area for bike riding, plenty of room to store and lock bike on property near the loft. There is also a griddle, electric frying pan, blender and hand mixer., Weber Gas grill.There is internet access. We really enjoyed our stay! Although I wish I had realized up front that there was not a standard stove/oven, it took no time at all to get used to cooking without either. The open concept floorplan was perfect for our needs - very airy, light, and easy to upkeep. We totally recommend using the outdoor shower rather than the one inside, the breeze feels wonderful after a day in the sun! Beautiful, clean loft. Location was private and serene. Deb was a great host! My mom and I could not have enjoyed our stay more! The loft was perfect! Just perfect for two! Excellent location, beautifully appointed, wonderful owners! Perfect guests as well. So enjoyed having you stay with us. 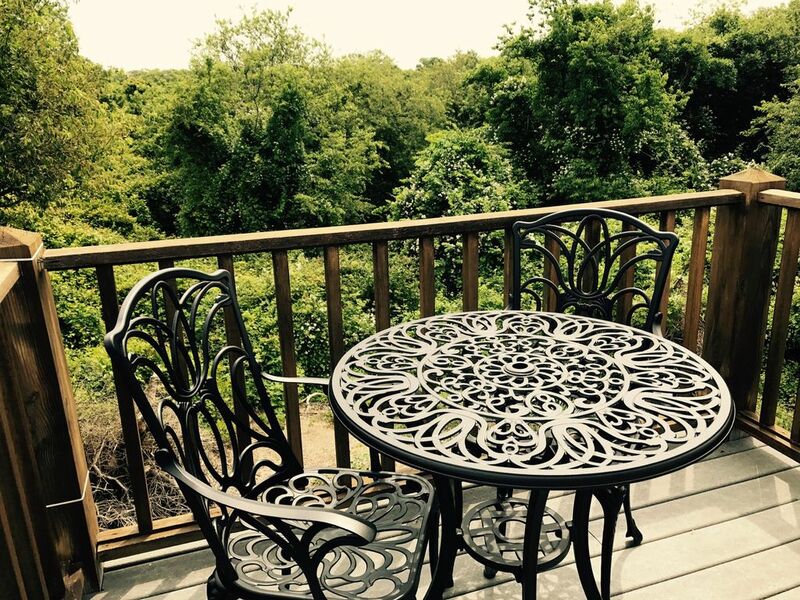 Beautiful property in the heart of block island. The back studio is above the garage a fair amount of distance away from the main house so is very private. When we arrived, the studio was sparkling clean and very easy to get into. There is everything one would need for a short stay inside with the exception of a stove but there is a grill outside which we used one night to cook dinner. We saw Ken and Deb one evening enjoying the sunset on their porch so we stopped by to say hello - very nice people. Since the studio is more in the center of the island, some type of transportation is recommended - bike, car, moped etc. However if by foot, nothing is more than 15 minutes away. Will certainly stay again and highly recommended. We so enjoyed having you as our guests and look forward to having you stay with us again. We booked this loft for our minimoon on block. It was a great place. Nice and homey, was perfect for us for our minimoon. Debra was really nice and even left us a bottle of champagne for our stay to celebrate. The place was very clean and she even had beach towels, a small cooler, etc for the renters to use. We had our moped so even though it was located in the middle of the island it was not a issue getting there for us. We would definitely stay here again. It was our pleasure to have you, we look forward to your next stay with us. The loft apartment is a perfect spot to enjoy a romantic stay. It is as private as your own home and just minutes to the beach, restaurants and the harbors. The apartment is clean and white, with tasteful decor. Would love to stay again! Block Island is surrounded by beautiful beaches and all of the boating, swimming and fishing activities that the Ocean setting provides. There are numerous hiking trails maintained by the nature Conservancy. The hub of this quaint Victorian town has lovely shops, restaurants, bars and entertainment venues. There are two movie theaters on the island as well as a Petting Zoo, Horse Back riding, and several art galleries. Don't forget your bike, Block Island is a great place to ride your bike.